A few weeks ago when I took part in the Goodwood Cycle Ride with my family, my youngest son Alex, who's 7, said he wanted to be like me. When I asked him what he meant, he said he wanted all the proper cycling clothing I have. As you can imagine, this made me really chuffed. I said to him that we'd have a look and see if we could find cycling gear his size. The following day I went to my local Aldi and they had some gloves that would fit him so I got those. A week later we were in our local Sports Direct and they had a suitable cycling top. The only item I couldn't find was padded cycling shorts. After a bit of searching on the web I found that Decathlon do some. Although they deliver, my son is a little small for his age and we drove to the store at Thurrock so he could try some on. I was surprised that the 6yr size didn't fit him but the 8yr did. Glad I didn't order them online. On a related note, Alex received a prize in the post from the British Heart Foundation after taking part in the Goodwood Ride for cycling more laps than anyone else in his age group. As you can image both he and I were chuffed! Well, today we went for a bike ride, just me a Alex. He was dressed in his cycling outfit as was I. 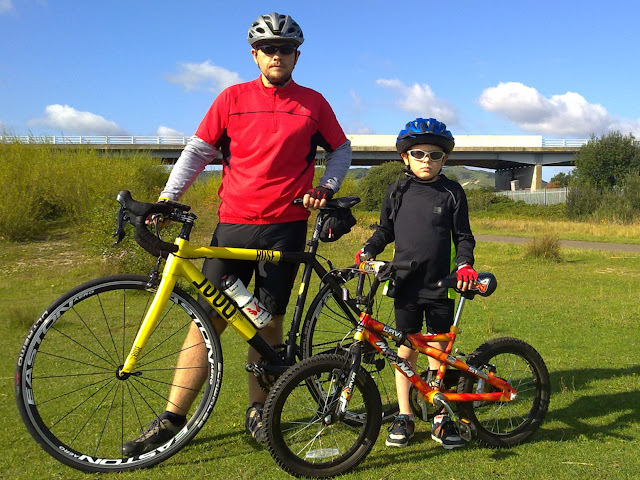 We went for a ride to Polegate via Shinewater Park. When we arrived in Polegate I suggested to Alex we go back via the bike shop and he said yes. He'd never normally agree to this! After looking at the bikes, including dome nice Dolan frames, we stopped at the park for a little play. We then rode back home. Total distance for the ride was 7.65 miles. Rides with my two young sons ages 8 and 10 are always among the most memorable. Congrats Dad on inspiring your boy!! That's a nice story and bodes well for the future. Sadly my 19 year old daughter wouldn't be seen dead with me out on a bike! But then that's another story. Both my sons enjoy riding with me and we do so regularly but it took a particular ride to make my youngest want to be like me. When we went to Decathlon both my kids saw a kids road bike they wanted. Might have to consider one for them for Christmas.